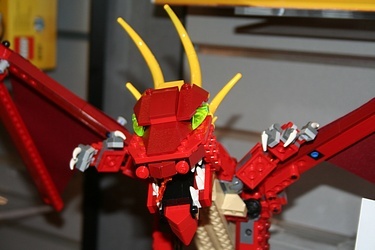 Lego's versatile and fun Creator line is still going strong as well, with two full display areas set up in their booth. We got a look at the pieces that are already in stores as of January 2009, like the Street Speeder and Race Rider - all very dynamic sets. The configurations we can expect for August were really great, though, including a 'Firey Legend' dragon, and a spectacular Car Transporter which for some reason makes me think of a repainted hybrid of GoBot Stacks and Tf Magnus - no real reason why, guess it's just that kind of day. Click the image below for the full Creator gallery!